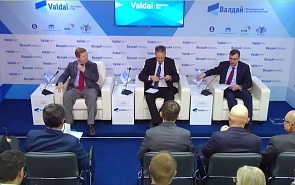 On December 5, 2018, the Valdai Discussion Club hosted an expert discussion on the state of affairs in Russian-American relations. The leaders of the two states failed to hold a full-length meeting on the sidelines of the G20 summit in Argentina. US President Donald Trump cancelled the meeting at the last moment. Nevertheless, a brief informal contact between Vladimir Putin and his American counterpart took place. Problems and misunderstandings in relations between Moscow and Washington are becoming more and more frequent. The pain points are the announced US withdrawal from the INF treaty and prolongation of the START-III treaty. Why the meeting between the leaders of Russia and the United States did not happen? How long will the domestic political agenda of the United States prevail over a joint solution of pressing problems? The participants of the expert discussion answered these and many other questions. Dmitry Suslov, Valdai Club expert, deputy director of the Center for Comprehensive European and International Studies, HSE. Ivan Timofeev, Programme director of the Valdai Discussion Club. On December 5, 2018, at 10:00, the Valdai Discussion Club hosted an expert discussion on the state of affairs in Russian-American relations.